Trying to Get Dazzled by SHINee's "Dazzling Girl"
Finally, finally, SHINee is releasing a Japanese title track that isn’t a remake of a Korean one. No more awkward lines — okay, just the typical awkward English lines, but nothing that comes out of a forced translation — and no more remade PVs. And it may or may not have something to do with the fact that they don’t have any other Korean tracks to remake. But I won’t say that too loudly, just in case they decide to start remaking the B-sides. The scenes in “Dazzling Girl” can be divided into three categories: the dance scenes, the solo shots and the “storyline” shots. The first two kinds are basically a must-have in every K-pop music video, but in this case, it’s the third one I’m struggling with. So we have a plain-looking girl (or more like a good-looking girl with glasses and a boring hairstyle) who, thanks to the skilled members of SHINee –who make her up, do her hair and choose some fancy clothes for her — ends up being a “Dazzling Girl”. We also have a dichotomy between one side of the mirror and the other — one of the being the “normal” world (or the room with the sofa), and the other one the “fancy” world (the one situated in the shiny set). I get the ‘dazzling girl’ storyline, I get the mirror duality, but I fail to see a relationship between the two of them, probably because the director spent half of the footage in slow-motion shots of the guys and Taemin close-ups and didn’t have the time to fully develop the story. It also doesn’t help the fact that every scene lasts less than 2 seconds, so it is tiring to watch and especially tiring to try to understand the story when the image changes every couple of seconds. There’s also a good amount of aegyo-filled solo shots, which don’t completely feel out of place but are definitely dispensable — “Dazzling Girl” doesn’t go for a ‘dark’ concept à la “Lucifer”, but it isn’t also specially cute like “Hello”, so a more neutral approach would have come out less awkward. Or maybe it’s just that Onew is naturally cute whatever he does. The styling is definitely worth a mention… and that might not be a good thing. All of the outfits were designed by Keita Murayama. The outfits are divided in two, just like the PV itself: in the room shots, the clothes seem to be more casual, while in the set shots the guys are loaded with jewelry and furs (yes, furs: as in the dead animals hanging from their shoulders). Key, for some reason, is out of place; he wears a raccoon when he’s supposed to not be fancy, and he looks fairly normal when he’s supposed to be fancy. While I’ve seen some of Keita Murayama’s collections and it’s clear he has a fairly interesting inspiration of Japanese traditional clothing without being gimmicky, the “Dazzling Girl” outfits are not his best pieces. The furs are just too much, and the guys just seem to always have way too much fabric on them. Their outfits in the ‘normal’ part of the PV are a bit better — I’m really liking Taemin’s jacket and Jonghyun‘s and Minho‘s clothes are pretty normal, but Onew’s shirt is plain ugly — and he’s probably dying of heat stroke under so many layers, poor thing. The choreography is complex and sharply executed, and I wouldn’t expect less from SHINee. There are some great segments, such as the intro segment where the whole group forms a tableau at the left of the stage and executes the choreography with discreet movements. There’s also a good amount of unconventional formations, which is always encouraged. The chorus, however, in its two variations, feels awfully awkward, especially the steps in the first chorus which are repeated when the chorus is later repeated a third time. Granted, they probably look ten times less ridiculous than I would doing the same step (or any K-pop step for the matter) but it still doesn’t make matters any better. It also feels at times that this choreography is paying homage to their past choreographies: there’s one step really reminiscent to the “Sherlock” dance and one very “Lucifer”-esque step, too. In short, “Dazzling Girl” choreography is not bad, but not as memorable as some of SHINee’s past (amazing) choreographies. SHINee’s Japanese music videos haven’t been anything outstanding so far; all of them have basically been remakes of their previous Korean MVs, and although “Dazzling Girl” has the advantage of being the first PV that’s not a remake, it’s still far from impressive. As a song, however, it avoids all the awkwardness that comes with a translation and sounds fairly J-pop-ish. Yet for all of the hidden jewels they have released as B-sides like “Kiss Kiss Kiss” or “Better” — there’s just something right about SM’s Japanese ballads. 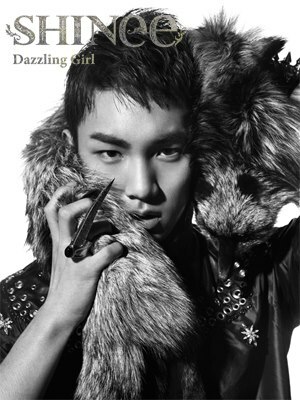 But “Dazzling Girl” was not as great as I expected. The instrumentation is great and I’m loving the piano accompaniment; the bridge before the chorus is dynamic and flows well, and although the voices are a bit over processed, the song definitely has potential. It’s the chorus that doesn’t do it for me; the echo is pretty gimmicky and it just falls a bit flat. And I don’t usually dislike Key as a rapper (not that I like him that much either), but his rap part here is the worst part of the track hands down; with the whole “gimme gimme gimme” thing. Not a fan. So what did you think, Seoulmates? 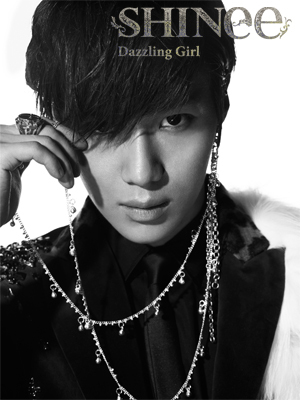 Did “Dazzling Girl” dazzle you?